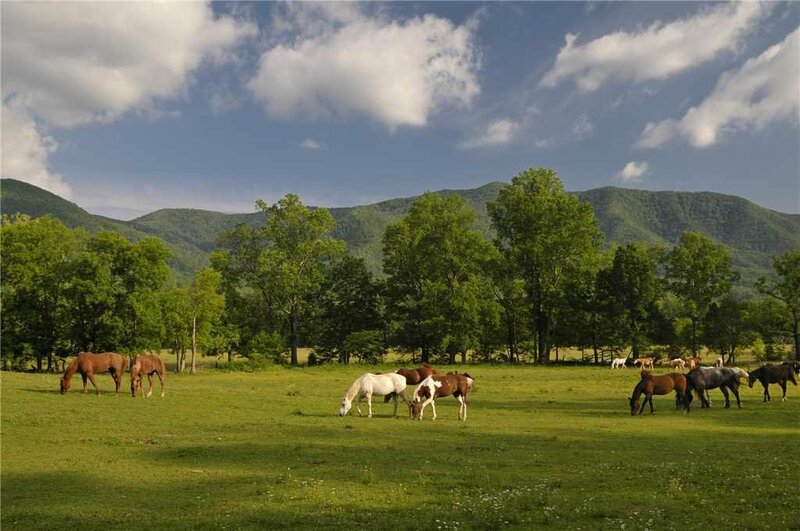 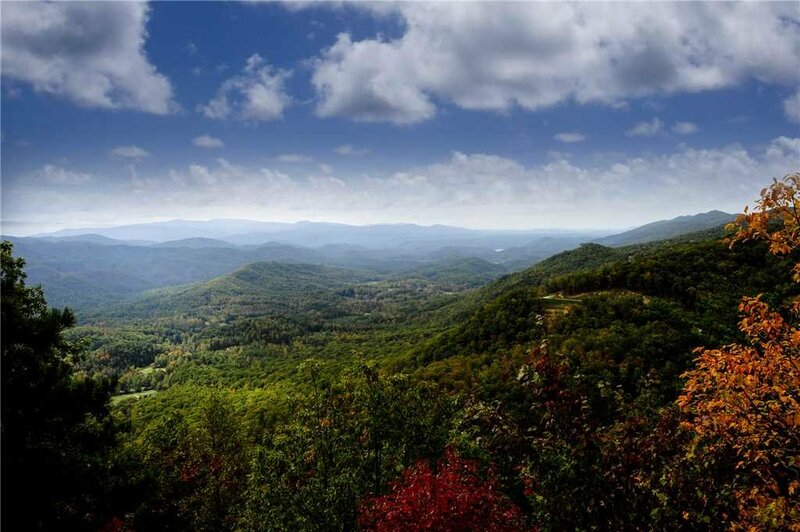 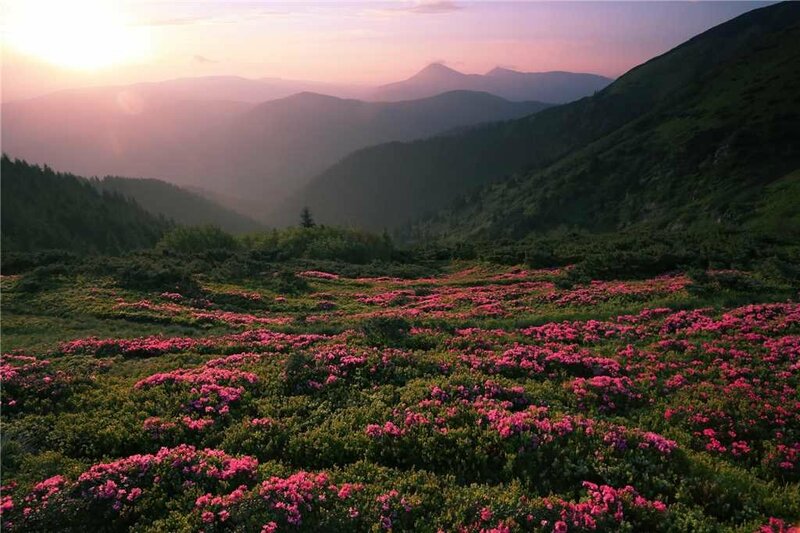 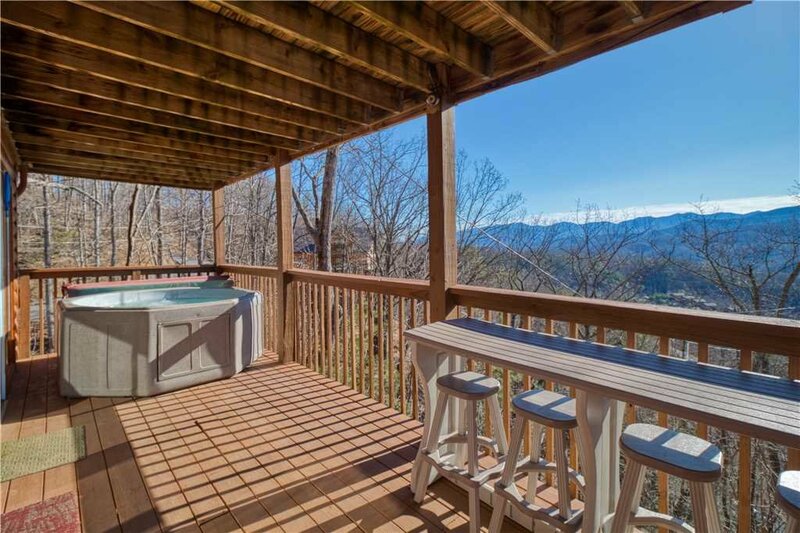 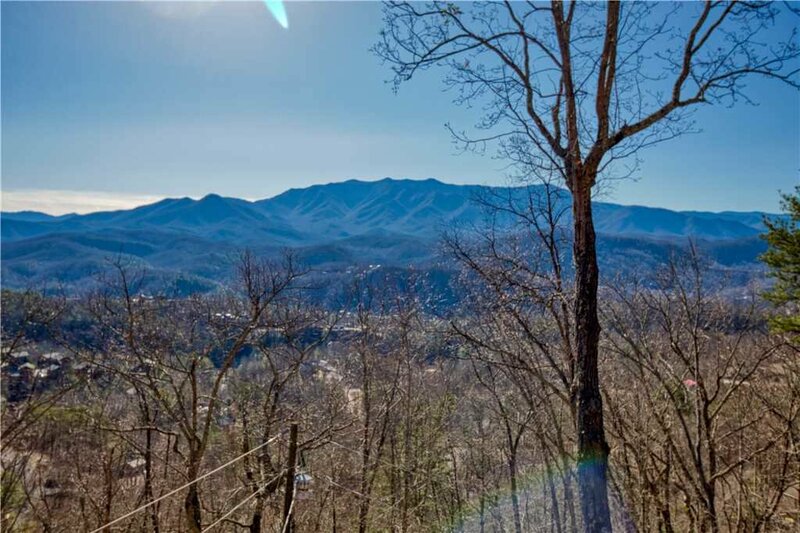 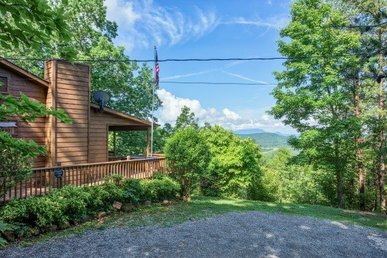 You might not see any bears during your stay at Black Bear Lookout, but you’ll definitely look out onto a spectacular view of the Great Smoky Mountains. 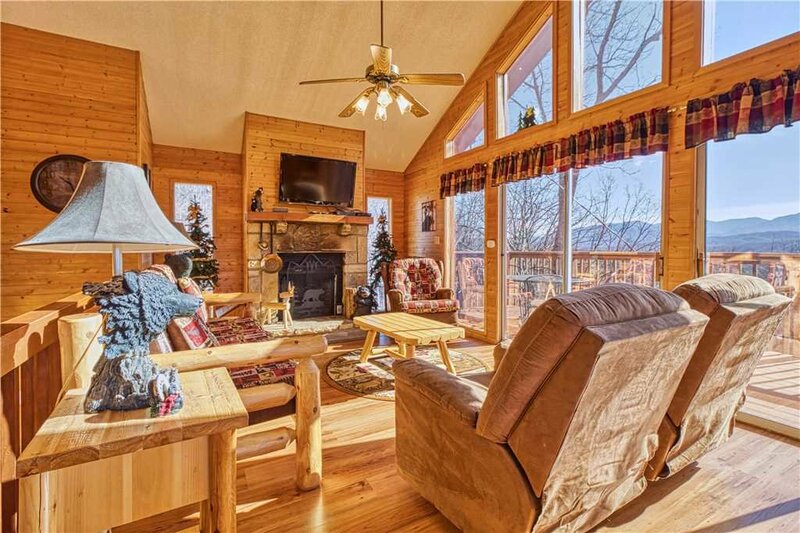 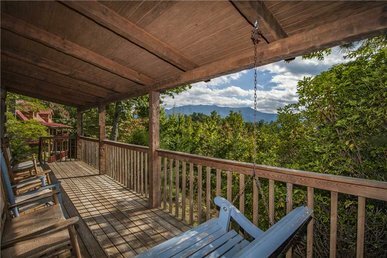 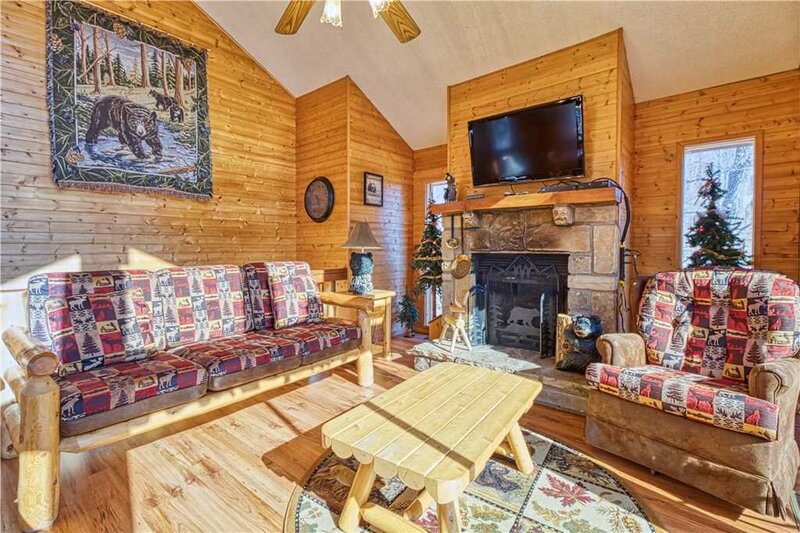 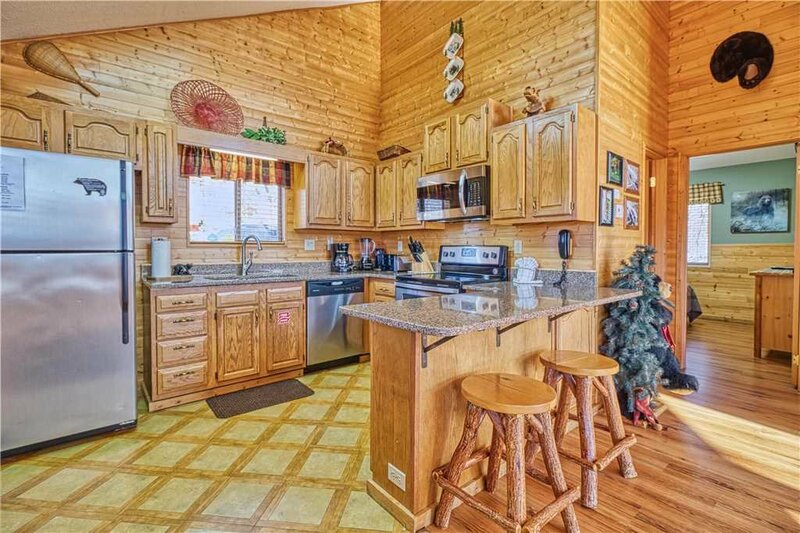 The 2-bedroom, 2-bathroom chalet is perched atop a ridge, so whether you’re on one of the decks or inside the home, you’ll be able to ooh and ahh at nature’s grandeur. 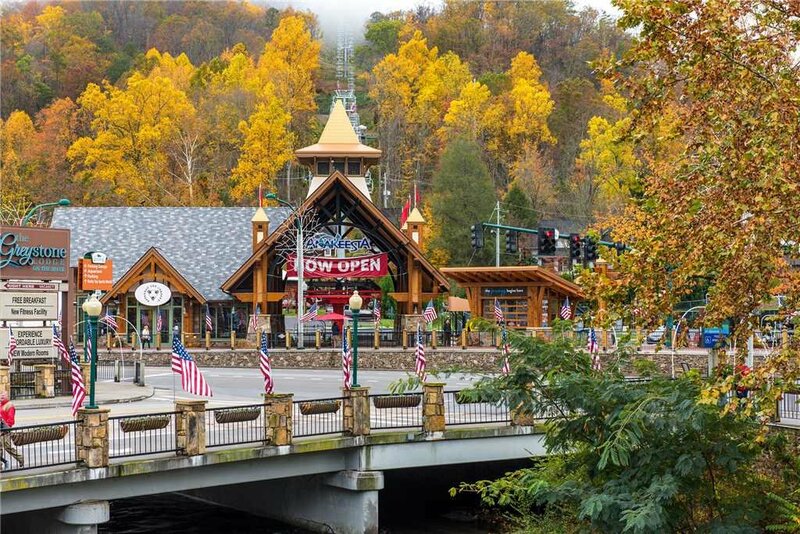 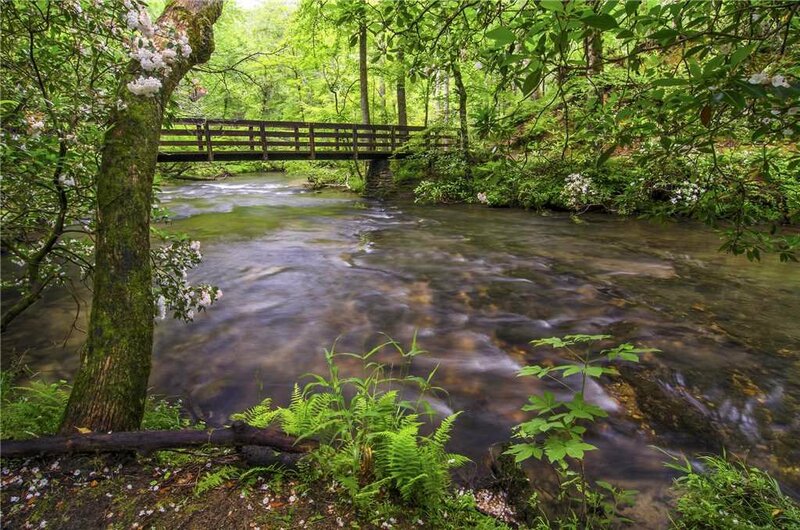 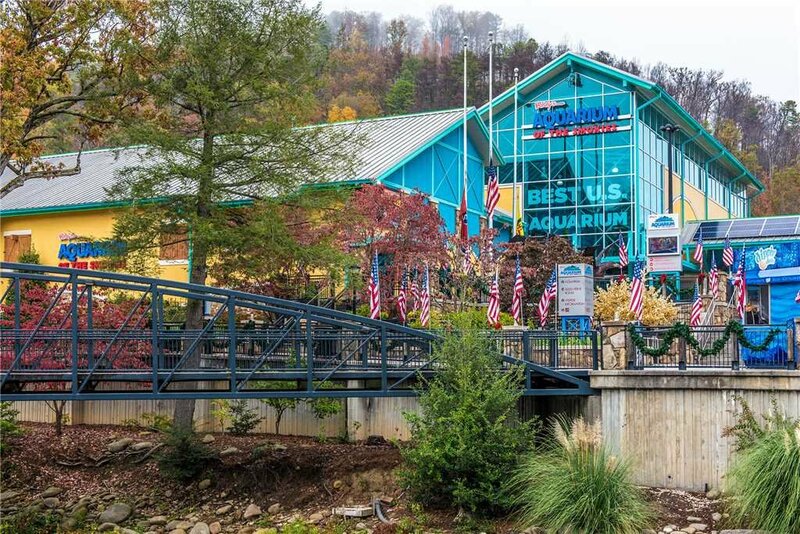 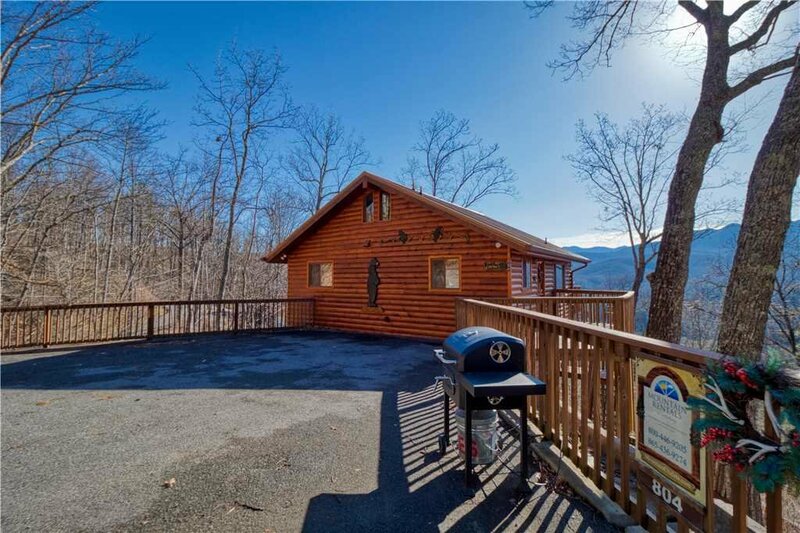 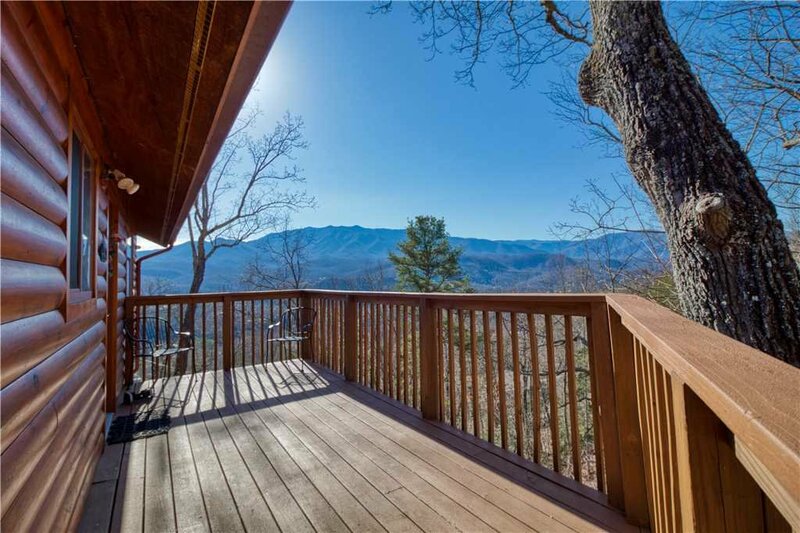 Yet the cabin is only a 10-minute drive to the restaurants, shops, and other attractions of downtown Gatlinburg. 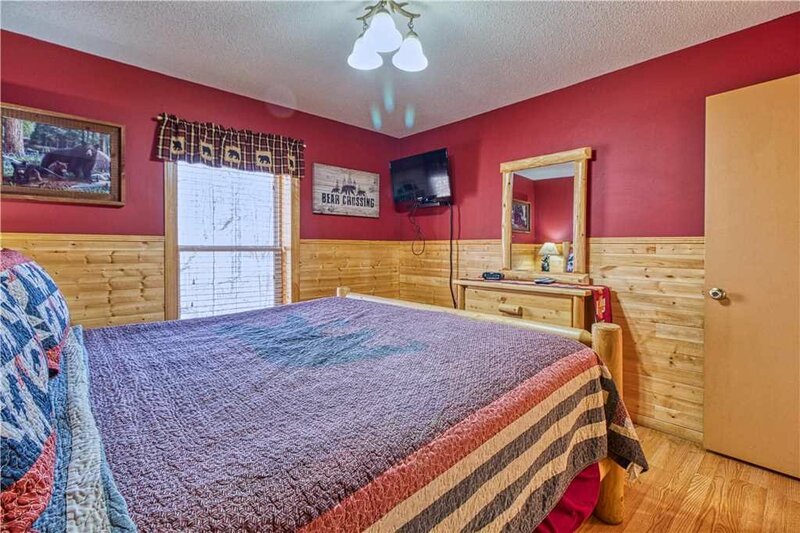 You can enjoy the best of all worlds here! 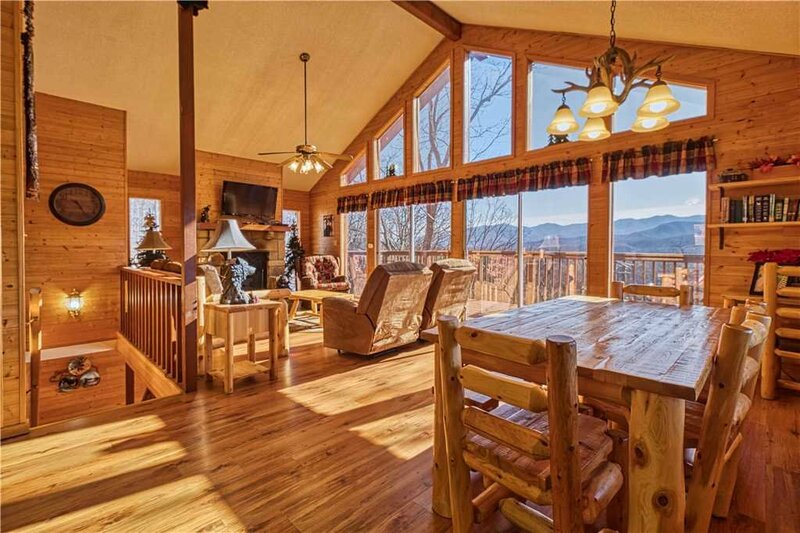 Black Bear Lookout has 2 decks that span the width of the cabin. 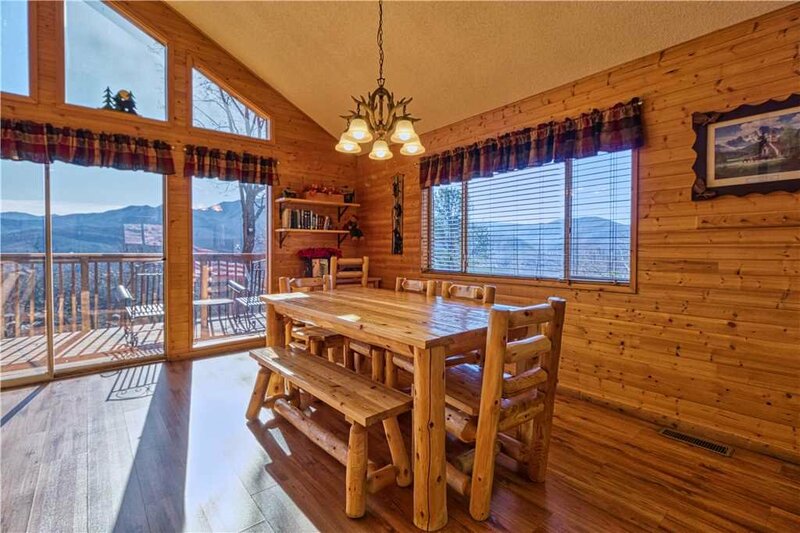 Both feature tables and chairs so that you can make the most of the glorious setting. 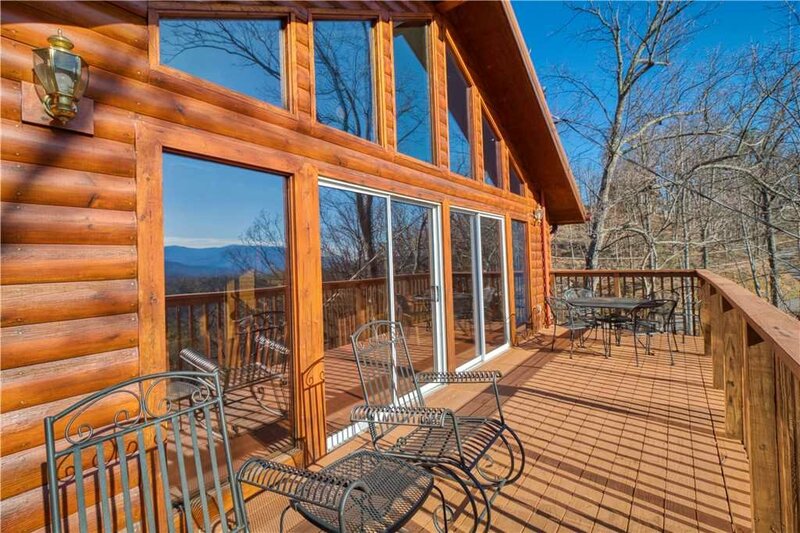 Sip your morning coffee outside as warblers and chickadees sing and the mist rises from the mountains. 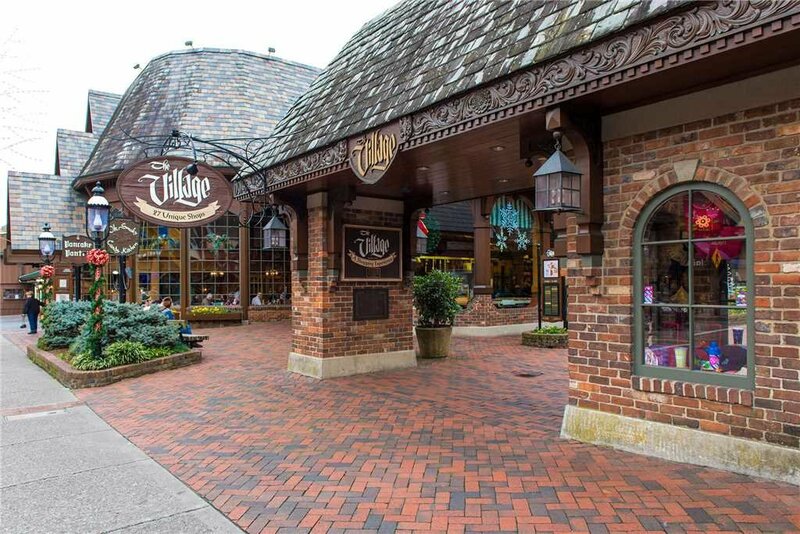 Enjoy lunch or dinner alfresco (the fresh breeze makes everything taste better!). 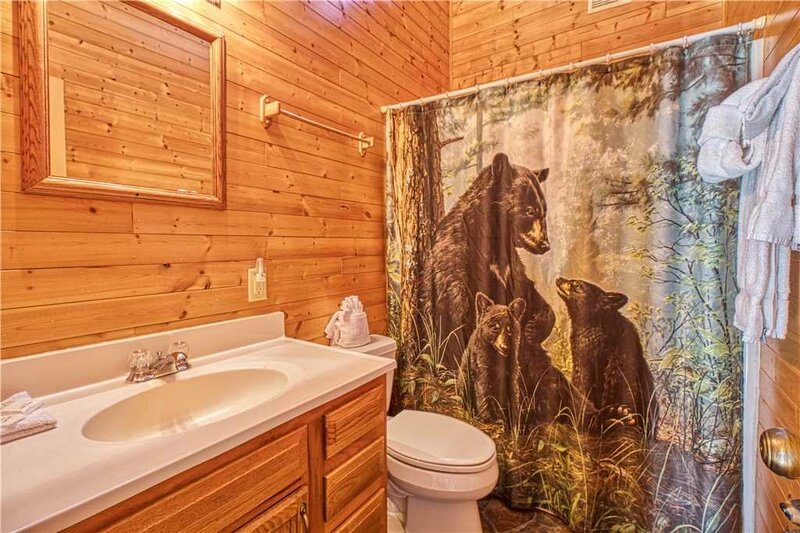 Stargaze before calling it a night as the whip-poor-wills trill a serenade. 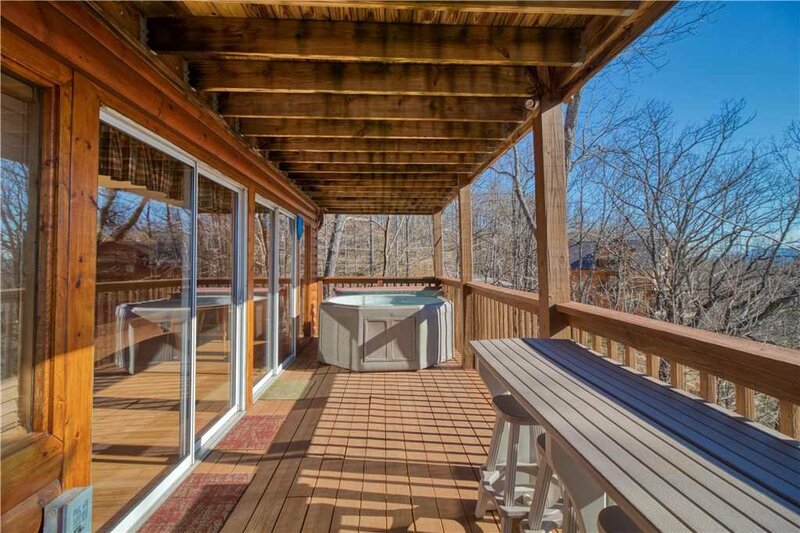 To make the experience even more of a treat for the senses, do so while luxuriating in the lower deck’s hot tub. 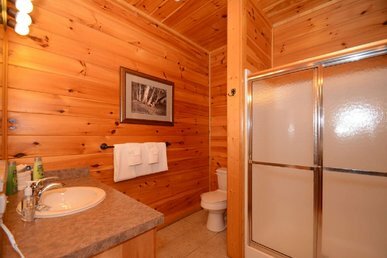 Especially after a day on the go, a soak among the massaging jets of water will revive your tired muscles and ease any cares away. 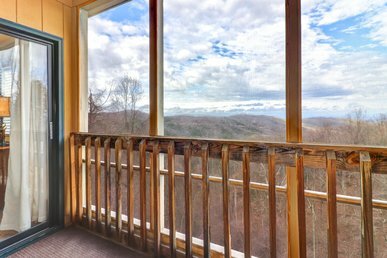 The views are just as awe-inspiring from the great room, located on Black Bear Lookout’s upper level. 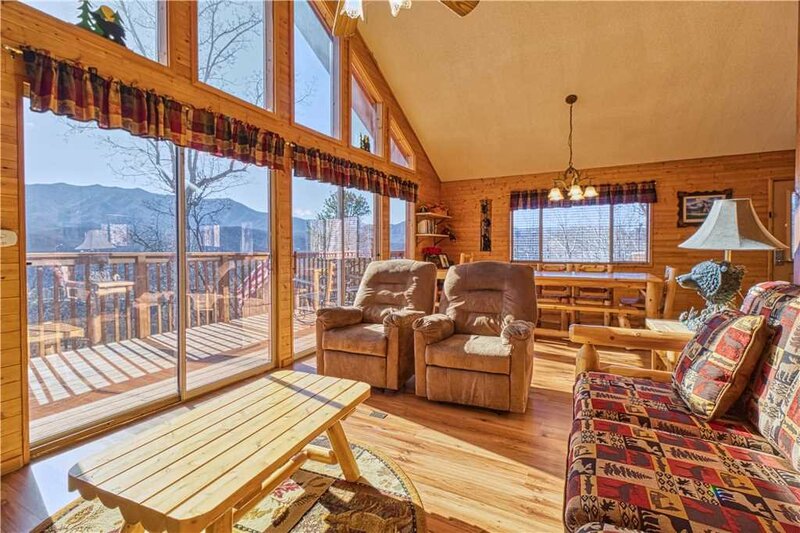 Oversize windows make up one wall, enabling you to watch falcons soar over the mountains even as you kick back in an armchair or stretch out on the sofa. 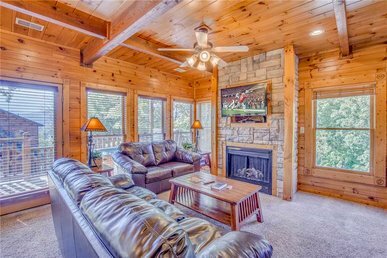 The great room also has a flat-screen TV with cable, along with a gas fireplace sure to be a favorite feature on brisk winter evenings. 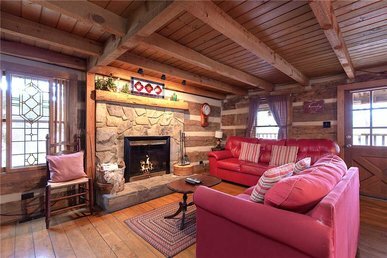 In addition to the living area, the great room includes a log-style dining table that seats 6 and a breakfast bar where 2 people can enjoy a snack. 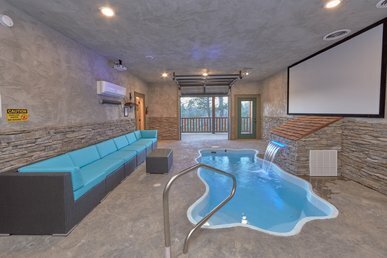 If you need to get some work done (though hopefully that’s not the case! 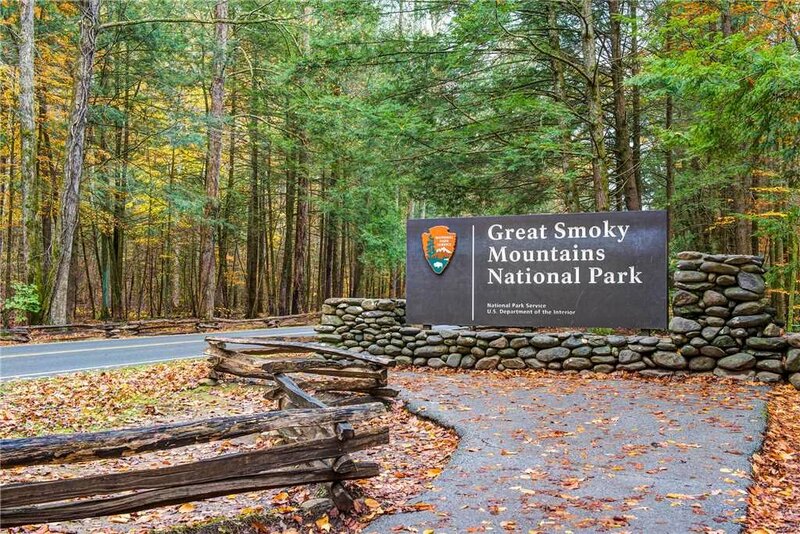 ), set up your computer at the desk; Black Bear Lookout has free WiFi so you can catch up on emails—or more important, research which attractions you want to visit. 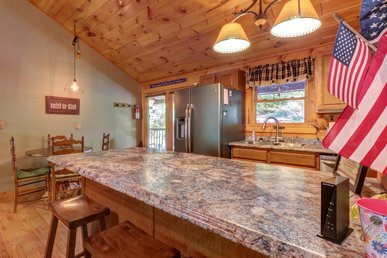 The cabin’s kitchen is equipped with a full array of stainless-steel appliances, cookware, and tableware; skylights ensure that it is as bright as the rest of the great room. 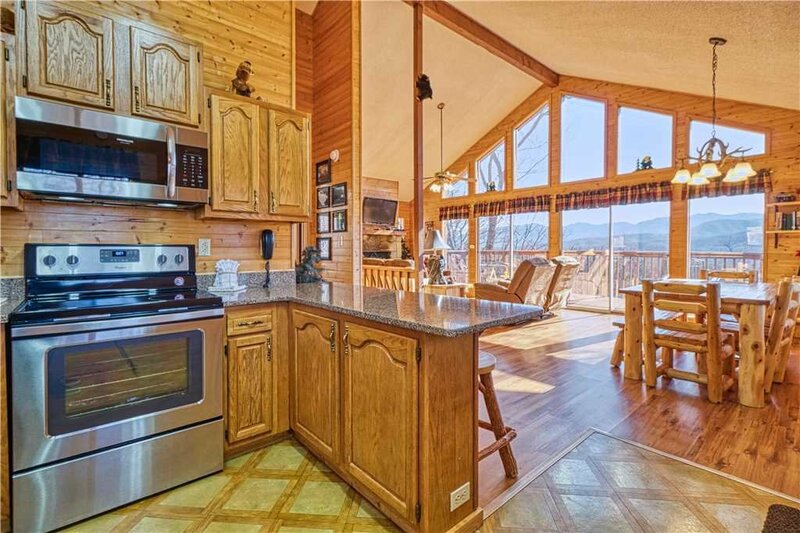 Even if you eat most of your meals at the numerous nearby restaurants, you’ll still appreciate having a fridge to keep milk cold, a microwave for making late-night popcorn, and a blender for mixing a batch of margaritas to enjoy on the deck. 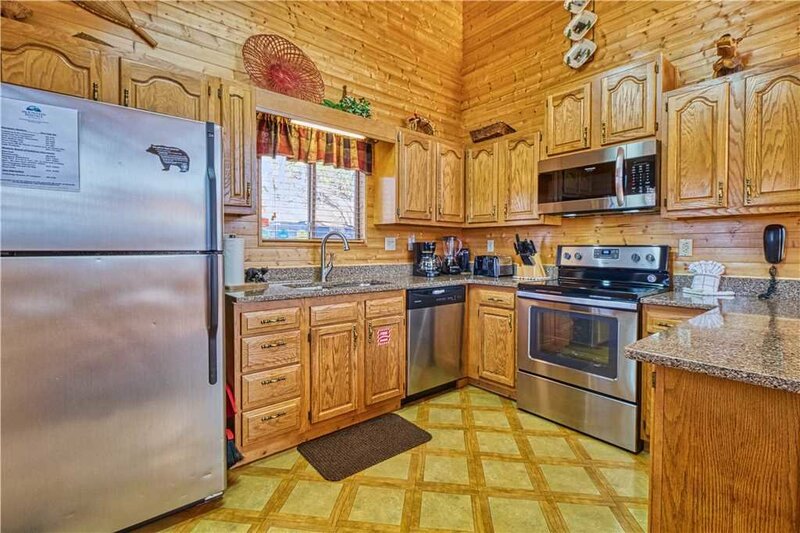 There’s a charcoal grill outside too, perfect for cooking any trout you reel in from the nearby streams—and steaks from a nearby store. 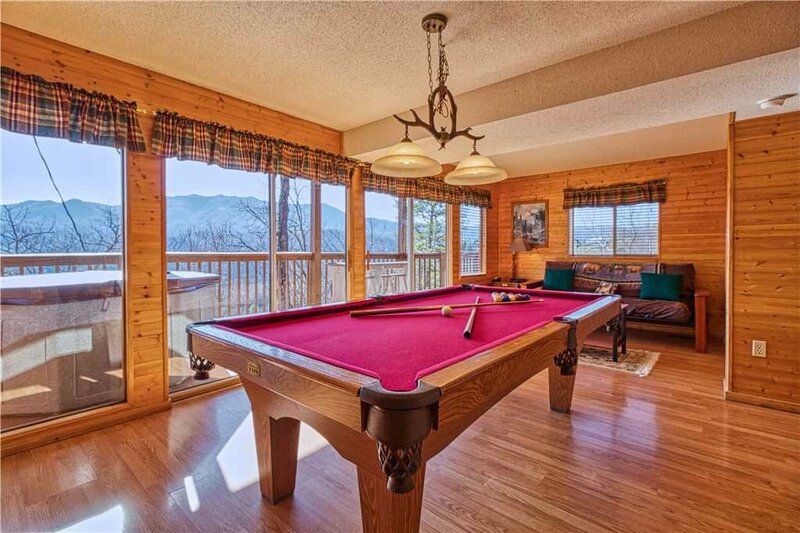 Black Bear Lookout has a game room on its lower level. 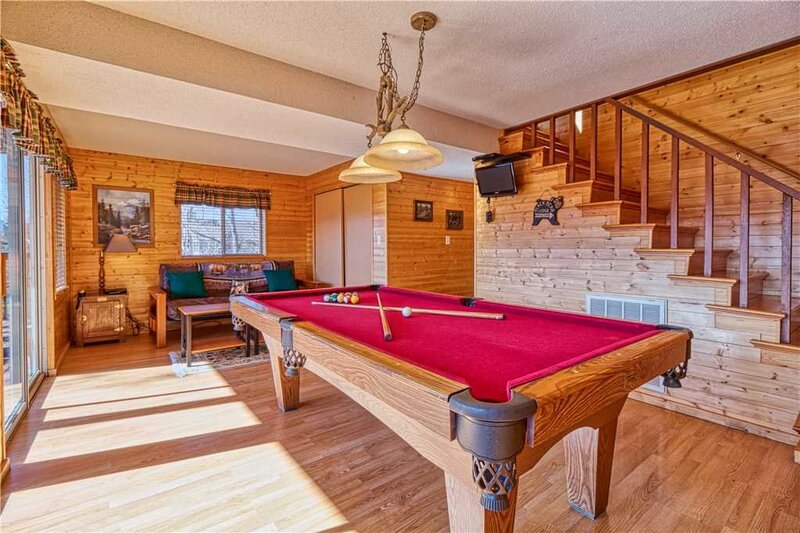 The full-size pool table takes place of pride, but there’s also a wall-mounted TV and a futon that opens into a bed for 2. 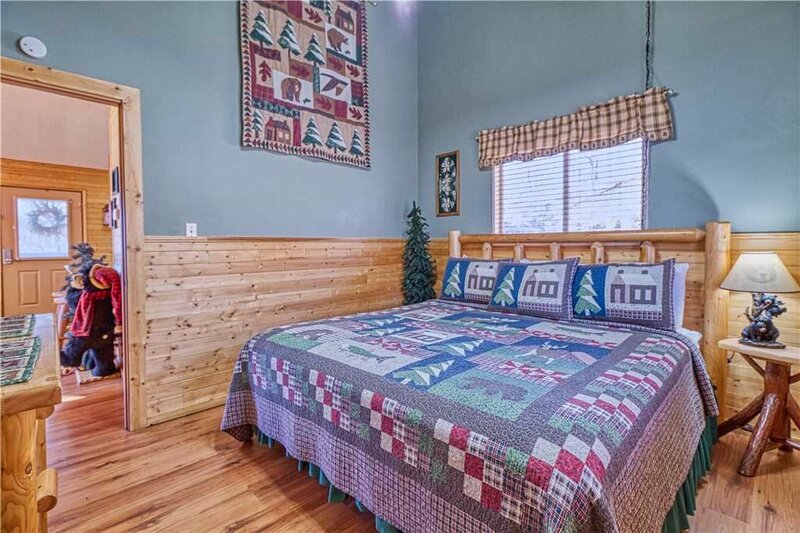 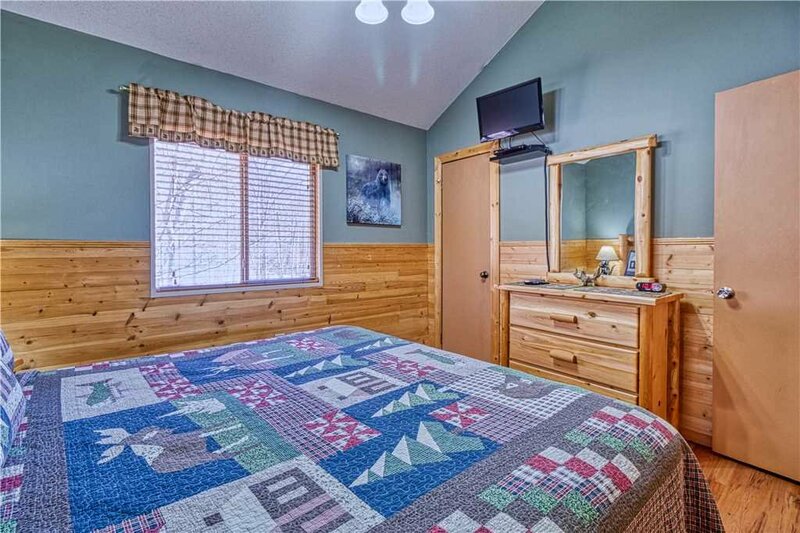 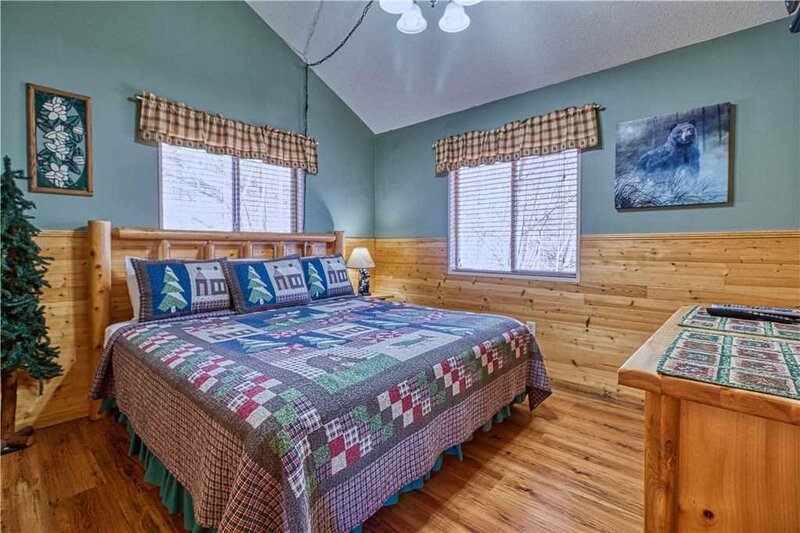 The cabin has 2 “proper” bedrooms as well, one on each floor for maximum privacy. 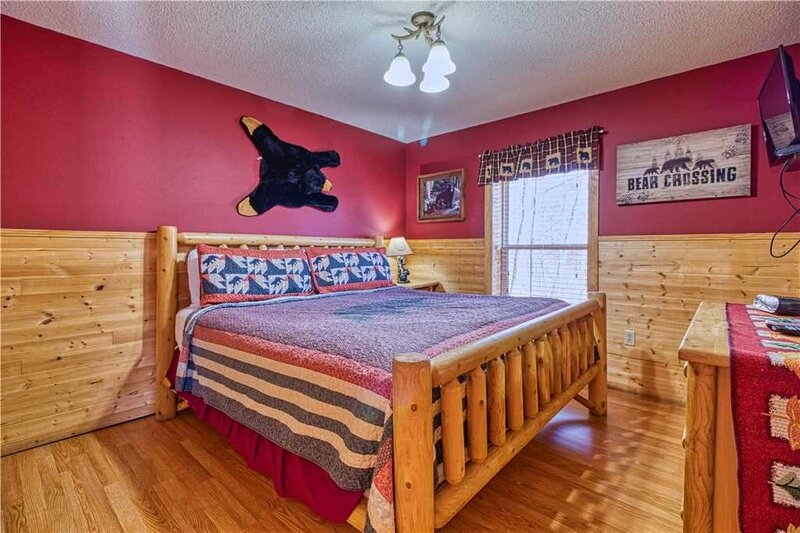 Each bedroom includes a sumptuous king-size bed and a flat-screen TV. 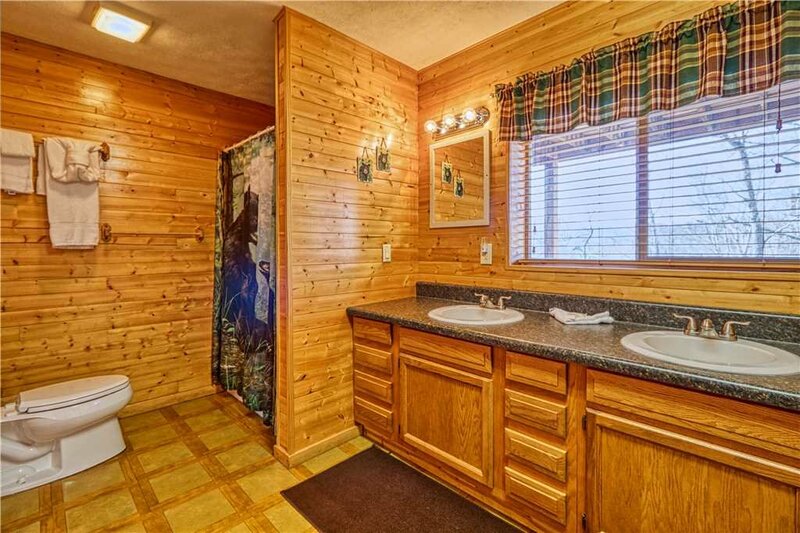 There’s a full bathroom with a combination shower/tub for each bedroom, which will make everyone’s morning and bedtime routines that much easier—no waiting on line to brush your teeth. 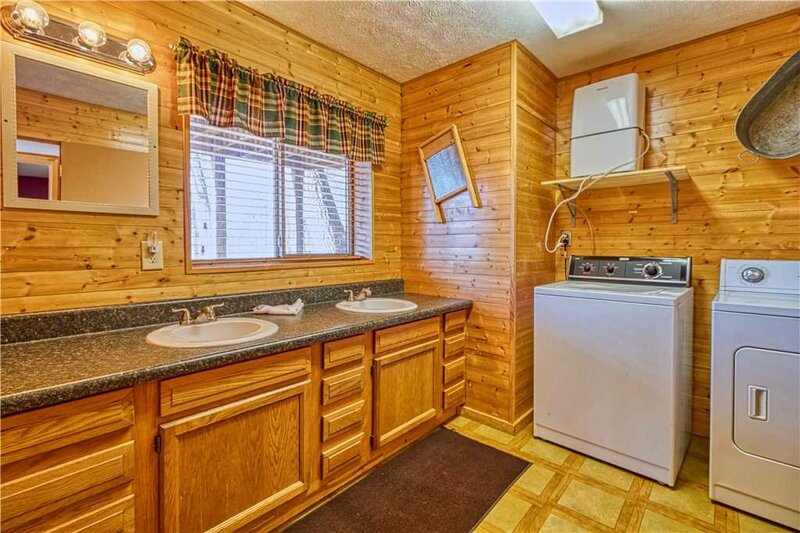 For even more convenience, the lodge has its own washer and dryer. 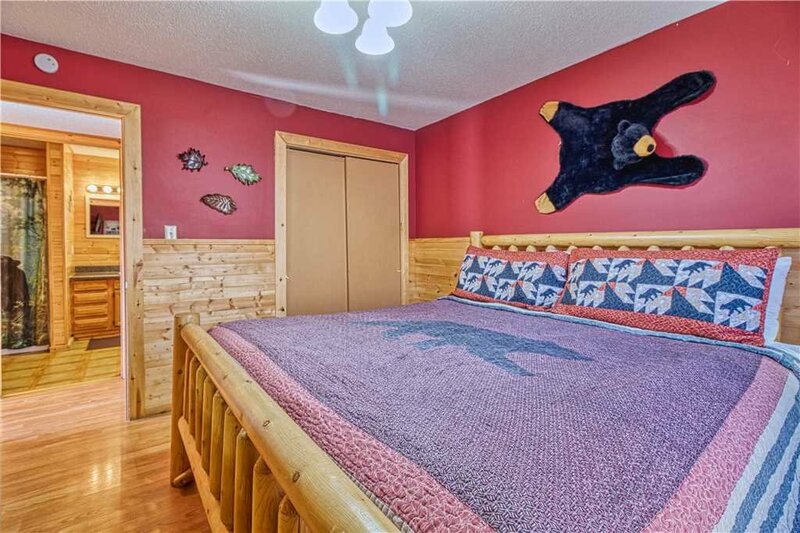 Guests have been known to come back to Black Bear Lookout time and again. 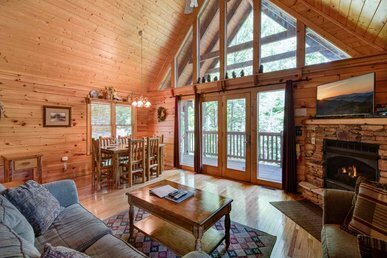 Don’t miss out on your opportunity to enjoy its comfort, convenience, and extraordinary views: Book your stay today!